One such idea was an amazing tool roll shared on instagram by @bookhou. 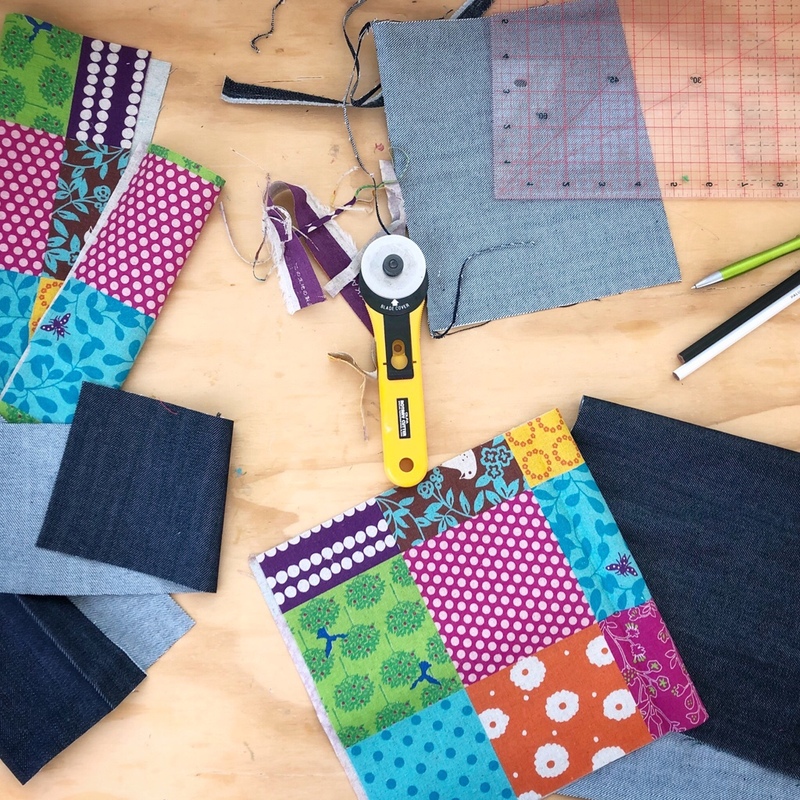 She had created a lovely tool pouch for a magazine article, around the same time I had received my latest yardage of my favourite patchwork print echino line. I love the idea of tool rolls/pouches, and have never gotten around to making one, but with us spending increasingly more time at the farm, and carting projects back and forth, it seemed like all the stars had aligned, so to speak, to make it the perfect project. 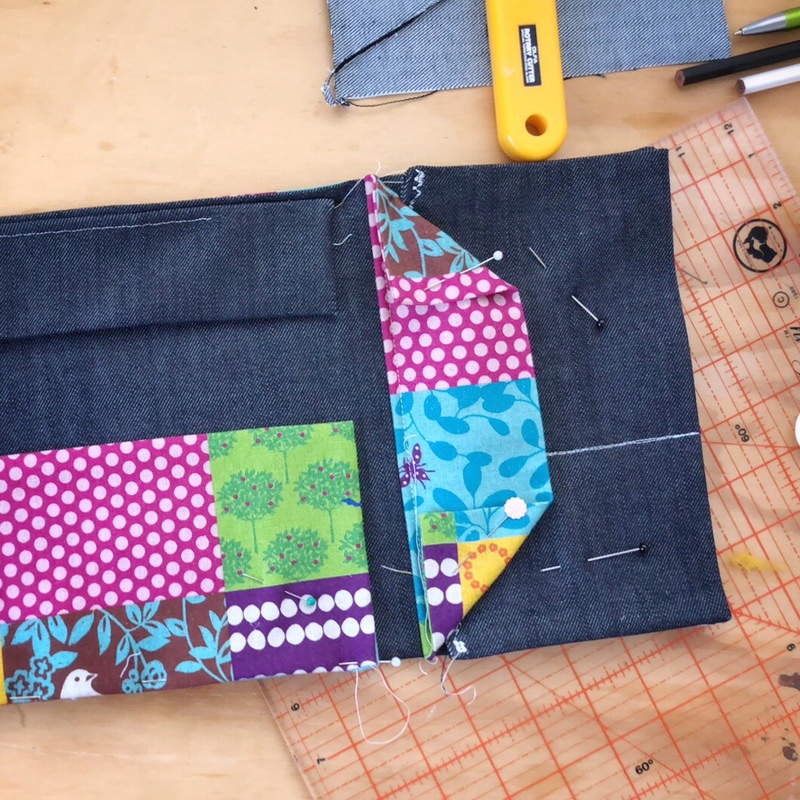 If there’s one thing I love in my sewing projects, it’s using denim as a construction fabric. I’ve used it to make overnight bags. Morning baskets. Journal covers. Kindle covers. Clutches. Even nappy pouches. It’s a good, solid basic, that helps add structure, and is nice and neutral to then play with accent fabrics or embroidery for a pop of fun. With a new, bright linen to work with as my feature fabric, denim was my obvious choice for the secondary fabric. Once I got underway, the project came together quite quickly. If I’d had a solid run at it, an afternoon would have been ample, but life has a way of laughing at one’s crafty plans, and so I had to steal a bit of time here and there to get it together. Cutting one day. The majority of the sewing only took an hour the following afternoon, and from there, it was just then the fiddly bits of working out what to use as the closure, and once I had that sorted, a quick thread snip, and it was ready to start hauling things back and forth to the farm. Except the longer it sat on my desk, the more I was bugged by the way the corners on the closure flap kicked up – and that was without having anything in it. By the time I add some bits and pieces into it, that kick would become more pronounced. So this afternoon, I plan to unpick the end seam and top stitching, and insert an extra denim flap, to give it a bit more length and also shape away the sharp corners, to make it sit flatter.